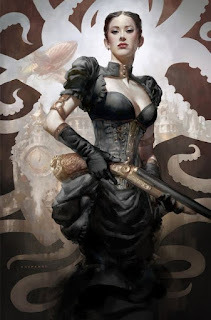 FLINTLOCK FANTASY: Episode II Play Report! - Gus as Pedro the Bruxi, an aspiring and helpful naval gunner rat who'd befriended Ramon on his return journey (Gus was unfortunately eaten by his children and unable attend). 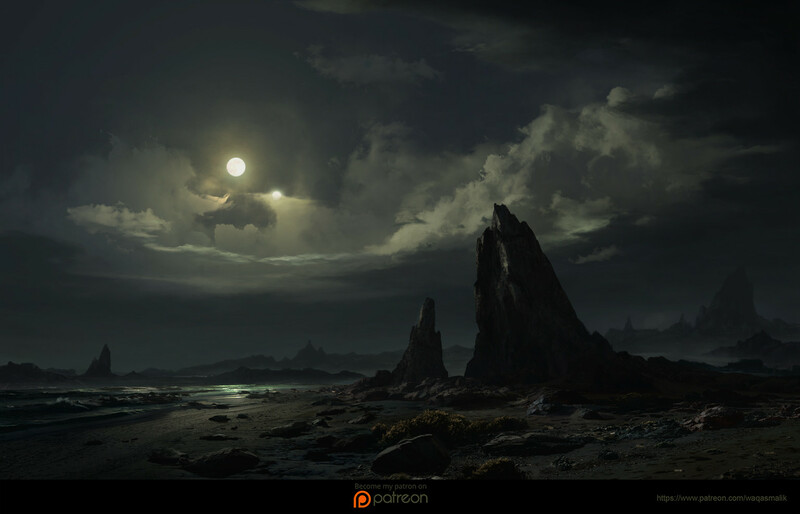 Members of the Malazar City Guard finally arrived at the Welcome Arms to begin their investigations, and as Lucinda hurried out to meet them, she suggested that Nym leave the Stone Book somewhere safe and secure. She did not see him place it in the vault and lock it; she truly did not know what happened to it when the guards spoke at length with her. They asked many questions about the Machetzas, the woman who vanished before Lucinda's eyes, and the location of the book that the gang wanted. Gabby proved surprisingly wily and cunning and palyed Lucinda very well, evading the questions and steering their inquiries as best she could. She handed them the tavern's books so they could see who else was staying there: Ramon had not given his last name, and Pedro the Bruxi wasn't even on the books. Which was for the best, for he was no where to be seen. The three guards clearly weren't that interested in the case, asking routine questions and failing to notice Ramon's lies. Likewise with Nym, who suggested that the book was actually gambling ring, not some arcane tome. (Nice time to roll a 1 there, sergeant). But they were advised to remain in the tavern overnight, in case there were further inquiries. And there were, but not in any official capacity: Lucinda caught a fresh faced young man by the name of Jonas, asking too many questions in the post-eclipse revelries. She escorted him to the guards upstairs, who instantly recognised him: he was an inquirer from one of the new boletins that had begun printing the news for mass consumption, and he was eager to learn what had happened. Meanwhile Nym ducked out into the afternoon to see if he could find a safehouse for them to stay. Ramon was certain that the Machetzas would return, and it would be best not to be at the Welcome Arms when they did. 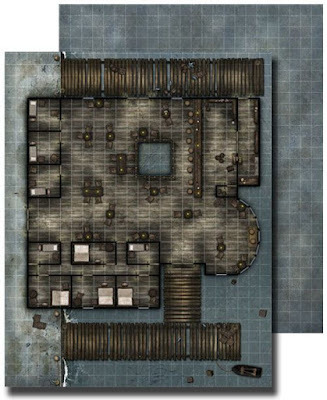 Nym uncovered two possible locations to lay low: an old store room above an obscurio shop, and the eyrie of a Tylluan family that had been missing at sea for some time. Both showed signs of possible occupation by others (orphan beggars above the store, and hints of a heretical church gathering at the eyrie) but both could be dealt with. With a claw Nym carved a message for the heretics "leave this place or you will be reported to the authorities", hoping that threat was enough to scare them off. When he returned to the Welcome Arms the mood had soured. Lady Margarié Regretta, the owner of the tavern and inn, had arrived and was grilling Lucinda about the tragic events, giving her a very loud dressing down in the backroom behind the bar. She was deeply upset by the death of Largo the bouncer, but also by the sudden attention the Welcome Arms was now receiving, when it had until now maintained a reputation as a quiet discrete location to gather. 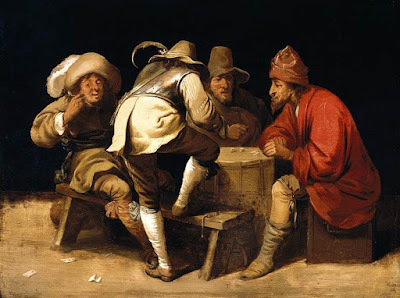 As the manager of the tavern Lady Regretta held Lucinda to be personally responsible, and believed that her new friends Nym, Ramon and Pedro had brought the tavern low. Lucinda offered to resign, but she did not find out if Lady Regretta accept it it for a number of city guards entered unannounced. The guards were followed by two golden-caped cazadors. 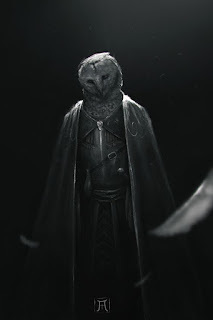 One was the tall Tylluan owl-man bearing a single scimitar: Nym had encountered him on the rooftops during the Machetza attack. The other a scarred and weary man laden with pistols and blades. The Tylluan stepped forward and in a croaky voice apologised for the intrusion, then directed all present to sit at the bar table before him. Ramon made a point of limping over in pain. Nym, Lucinda and Lady Regretta joined him, as well as the few other patrons present. Pedro was nowhere to be seen. 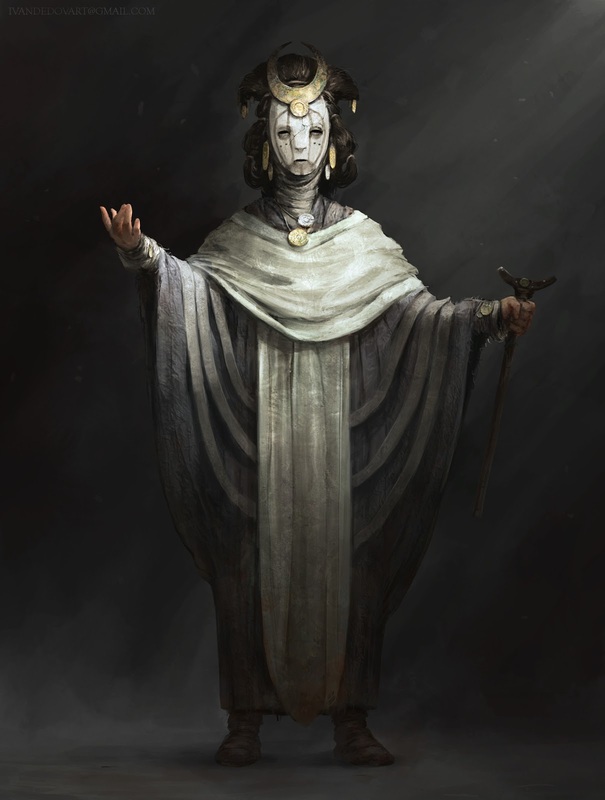 Then eight heavy cowled monks entered, wearing only the indigo robes of the Malazari royalty, and between them they carried a tall but narrow sedan box on two rods. 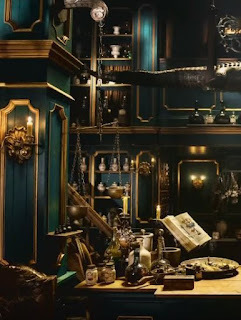 Black lacquered, gold trimmed, adorned with the symbol of the lamprey, and completely enclosed with carved wooden screens it was clearly carrying a highborn noble. But the hideous ragged breathing that gurgled slowly within, and the strange stink that washed over them marked the passenger as something other. Besides the sedan walked another monk, indistinguishable from the rest, save for when he pulled back his cowl and raised his head to address those gathered before him, who recoiled when they saw that instead of eyes, two leeches squirmed beneath his brow, growing from under his eyelids, searching and seeking for something. When he spoke, his voice was kind but distant, but the breathing within the box quickened its pace. "Tell me... of the Hydiac." Each person present who had encountered the creature had a sudden flash of memory. The creature had escape the tavern not hours before, and the recollections where still fresh. For Ramon it was the sight of the mass of tooth and tentacle, eye and maw, where but a moment before the mysterious woman slumped over, pinned to the wall by Ramon's blade. For Nym it was the bulging wall of bestial flesh filling the doorway to his room, flexing its horrendous musculature and ripping the side of the tavern apart as it fled. The Tylluan cazador tilted his head, shuddered, then spoke next, in complete unison with the leech-eyed man as the gurgling behind them bubbled and frothed. "Tell me of the woman." Lucinda's mind flooded with memory from the bar fight. She was grabbing the volatile liquors from the end bar, glanced over at the woman: plainly dressed, a fishmonger perhaps, but her hair in an unfashionable bob haircut. But she was muttering something quietly to herself, and her hands... shimmered. And then she vanished. Ramon saw her up close again, in the last moment before the woman... changed. Her weathered face slackening as she slipped from consciousness. Every detail of her face revealed for an instant. Nym recalled how she stood at the doorway to his room, demanding the book he had in his arms, her own arms shimmering with the speed of their shaking. The weapon-laden cazador now joined the chorus. The thing in the sedan, clearly controlling them, panting under the effort. "Tell me of the Book." Lucinda's and Ramon's recollections were indistinct, flashes of the conversation two hours prior in the secret backroom of the Welcome Arms, Lucinda suggesting to Nym that he store it someplace safe. But Nym's recollections were crystal clear: he had studied if for several days since it came into his paws, and his last memory was of placing the book in the storage vault and shutting the door. He could hear the latches lock with a click as he shut it. The Tylluan cazador shook his head then asked to be taken to the vault. Lady Regretta rose and under protest led him downstairs to where the book was stored. The rest waited uncomfortably; the book had already drawn far too much trouble from powerful members of Malazari society and they were eager to be parted from it (though Nym was keen to learn the rest of its contents first). A scream came from downstairs. Lady Regretta rushed back up. "The book! It's been stolen!" The laboured breath within the sedan was almost ecstatic. "Tell me who stole the Book." But no-one had any inkling who could have done it. They were almost relieved instead, for whoever had taken it would now become the focus of this interrogation, not them. Whoever the thief was, they were not present. The gurgling slowed, relinquishing its grip on the cazadors' voices. The Tylluan bowed curtly, apologised once more for the intrusion, and then the leech-eyed man escorted his horrid master off the premises and out into the streets of Malazar, followed by the retinue of guards and the cazadors. Everyone in the Welcome Arms was greatly relieved by their departure. Ramon was especially unsettled by the leech-eyed man. What the hell was that thing? But it was Lady Regretta who was first to act. 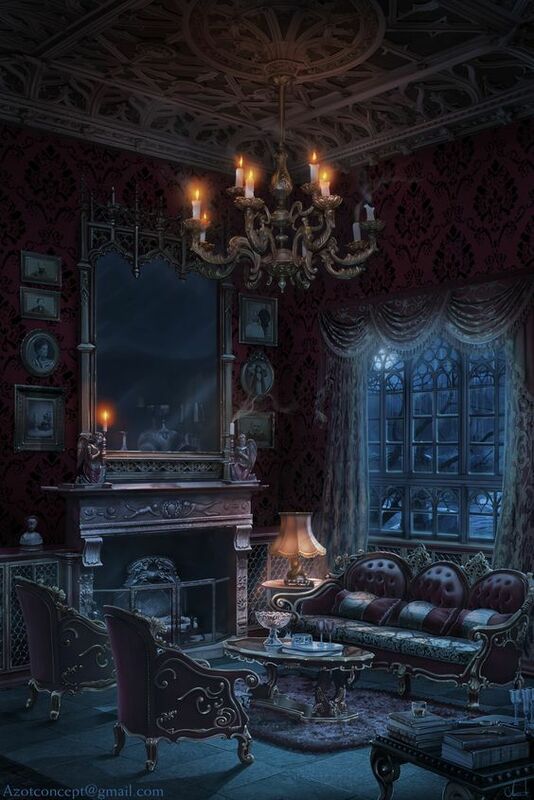 She gave orders for the Welcome Arms to be shut for the night, and then made it quite plain that Lucinda, Nym and Ramon were to return to her townhouse and join her for the evening to discuss what had happened. Sensing this to was an order and not an offer, the three gathered their possessions then climbed up into the waiting carriage outside. The carriage cut across the city, leaving the Northern Slums, crossed several canals, reached the old walls that guarded the heart of the metropolis where it drove past arenas and auditoriums and entered a salubrious neighbourhood down towards the main docks. Here the tall streets were clean and patrolled by private guards. 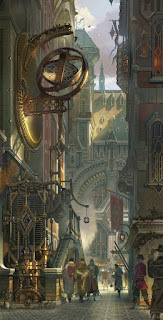 The carriage pulled into a narrow gate beside a beautiful terrace; Nym drank in the details, his heart filling with envy, but Ramon was suspicious of such wealth and wondered where it came from. Servants greeted them at the door, and they were ushered into a resplendent lounge. And there, getting to his feet, was their friend Pedro. In his arms was the book. "I did as your Ladyship asked of me and emptied the vault," he explained. "Everything is here." He pointed to the files of paperwork and locked boxes on the lounge table before him. Lady Regretta smiled and thanked him, then made it clear to the four of them that whatever was in that book she wanted to know. If the Hydiac wanted it, if the Machetzas wanted it, and now if the Malazari Crown wanted it, then whatever it was it was extremely valuable. She wanted to know how it came into their possession: Nym explained that his long time mentor Viski Padipurr had given it to him for safe keeping after a deal of some sort between him and the Machetzas went bad. "The Master Thief?" she asked, seeming to know the famous Mog. Nym nodded. In the end a deal was struck whereby Nym and Lucinda would use their alchemical extracts to help them comprehend the contents of the book, and Ramon and Pedro would be responsible for their safety. She would pay them handsomely for their efforts, and they were welcome to stay at her terrace for now. It had been a long day, and a tiring night, and the four were shown to their rooms; the book was returned to Nym. But they met one last time before sleep, eager to discuss the situation in private. They were unsure of what they were being dragged into, or of Lady Regretta's intentions. She was a war profiteer and arms dealer of some sort, and they did not believe they could trust her. But the bargain had been struck, the accommodation much to Nym's liking, and the pay was very, very good. The book was titled "THEORETICA ON THE DESIGN OF THE DEMONLOCK FIREARM & THE MEANS TO ACQUIRE ITS BASE MATERIALS" by Doctor Palso Anduriac, and was written in the Luzori language in the city of Kvantio. Everyone new that name: it was the cursed city where the Stoneland Wastes were born, where everything within one hundred miles was completely turned to stone. Brave adventurers would enter the Stoneland Wastes, and bring out relics and remnants of that lost city. This book was clearly an artefact from one such expedition. In summary, the illuminated manuscript was a treatise examining the current state of firearm technology in Thaumatria, and suggested a dangerous by highly effective means to improve it and gain an edge in the arms race that gripped the nations of the continent. It contained blueprints and instructions on how to construct what it called a Demonlock Pistol, that was capable of using Demonstone Powder to greatly increase the firepower of current weapons. The pistol itself was an impressive but mundane design, but the methods of obtaining Demonstone Powder were outright heretical. First one must summon a demon of the Jugger Behem. Then one must have it petrified by the gaze of a gorgon from the southern continent. Grinding down the petrified demon into a fine powder produced the desired compound. It was a wild and outlandish proposition, but according to the account given in the final chapter of the book, four Demonstone Pistols were made and a batch of Demonstone Powder successfully acquired. Part of the book was definitely arcane in nature. 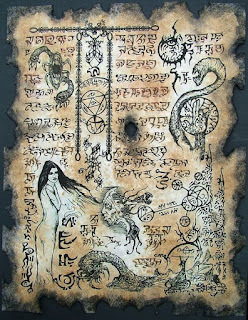 The chapter on summoning Jugger Behem — a tract that was so dangerous mere possession of it would warrant execution — was the source of the emanations, written with another's hand, and it was Lucinda who noticed that in the monstrous marginalia was a completely blank circle, whereas the circles on various other pages were filled with strange sigils. She was unsure what this meant. While this research was being conducted, Ramon was becoming increasingly frustrated. His suspicions of Lady Regretta were growing in spite of her increasing generosities. He had seen things during the Siege of Lapramada that had deeply troubled him, and he could not shake his fears. 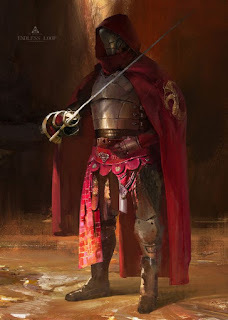 But his ruminations were interrupted when a Bruxi messenger, who had been sent to the Welcome Arms and escorted here by one of Lady Regretta's servants, arrived with a communique from a friend in the city, warning him of impending threats. Ramon voiced his concerns with his friends during a break in their research, and Lucinda decided it was time to reveal something disturbing that was likely to be connected to this dark trade in arcane weapons. She had been tracking the machinations of the de Camondo family for some time. They were prestigious arms dealers that manufactured artillery for the Malazari Crown — Ramon and Pedro recognised the name from the stamp on the side of many a fine cannon. It was possible that the book detailing the construction of Demonlock weapons was destined for them. She knew the de Camondos were working towards a major weapons delivery due a month from now, and that they had been buying up large quantities of condemned criminals from the Malazari slave markets. She was yet to see how all the pieces connected, but she was sure there was one. At that moment a servant interrupted: there was someone to see Lucinda at the front door. Warily Lucinda opened it, only to find the Bruxi messenger who had delivered Ramon's letter earlier that day. The Bruxi held up a rolled piece of parchment, unfurled it, and compared the illustration of the woman upon it with Lucinda. Someone had posted a bounty on her, and the keen-eyed Bruxi had spotted her before. With a quick bow and a word of thanks he darted off into the darkness. Lucinda rushed back in, warning her friends that they had to leave immediately. They gathered up their possessions, taking the book with them, but left incomplete notes behind for Lady Regretta. They also left a message explaining that they would return is several days, and would complete the translation then, for they suspected that Regretta would be a fine ally and terrible enemy. As they scarpered back across the city to the safety of the more familiar Northern Slums, Lucinda grabbed one of the numerous wanted posters that had been plastered on the side of a wall: 500 crowns were offered for the capture and safe return of one Valentina de Camondo. "That's me," she said. The book is titled "THEORETICA ON THE DESIGN OF THE DEMONLOCK FIREARM & THE MEANS TO ACQUIRE ITS BASE MATERIALS" by Doctor Palso Anduriac, published by University of Kvantio in the year 406CC (some six years ago and after the advent of the printing press; why it is illuminated by hand and not printed en masse is not stated). It is written entirely in Luzori; while the script used is identical to that used in Malazari and Thaumatri, the language is quite different. 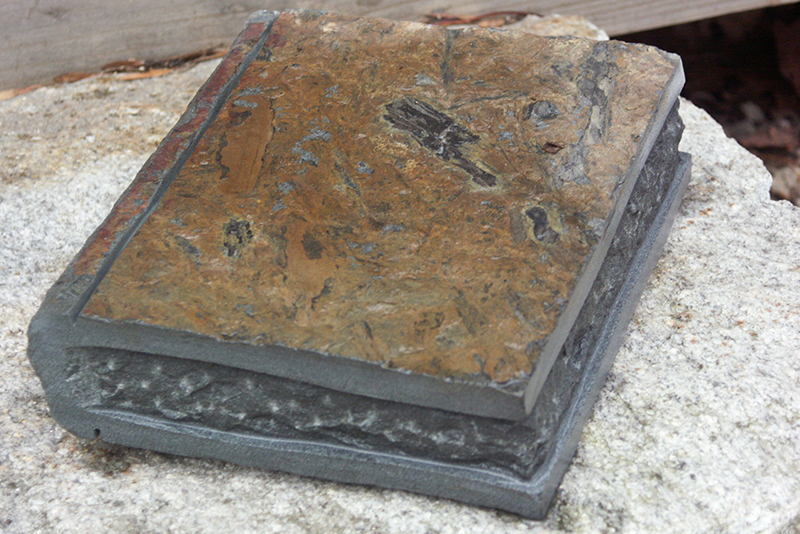 Given the petrified nature of the book it is very fragile. Every bit of it has been transformed into grantite or shale, and the ink has turned to veins of obsidian and other semi-precious stones. Whenever it is opened, the reader must make a Reflex Save DC 12 or 1d10 pages will snap away from the spine (roll d8 to see from which section); a second Reflex Save DC 12 is required or the pages shatter entirely. Part Three contains technical information on the construction of the demonlock mechanism, as well as the formula required to prepare the demonstone powder. A character skilled with Craft (firearms) will be able to follow these instructions to create a prototype demonlock pistol, though it is a DC25 Craft check. 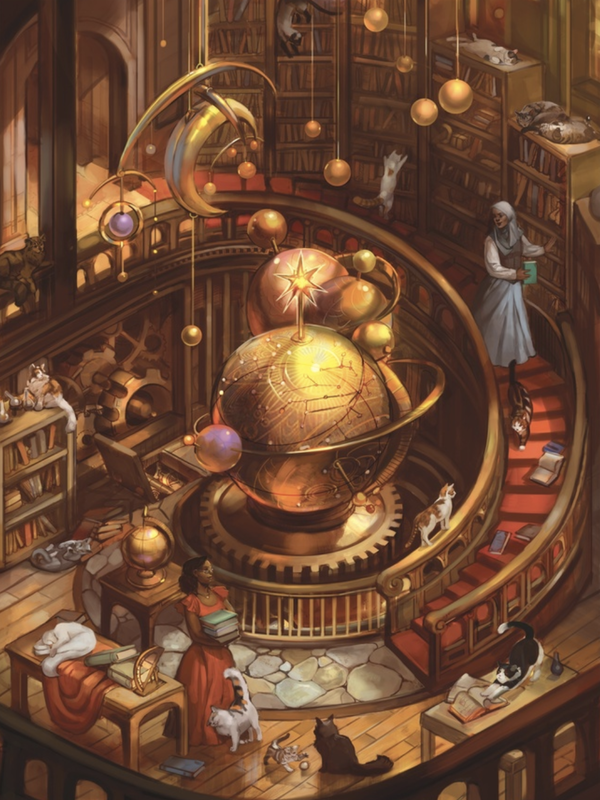 A character skilled with Craft (alchemy) will be able to follow these instructions to create demonstone powder, though its ingredients are very difficult to find… (32 pages). Part Four contains the process by which demonstone powder can be acquired. This section of the book delves deeply into heretical theories and sorcerous magic, for it involves the ritual summoning of Jugger Behem to this world – a heinous sin in the eyes of almost all faiths and states. It follows the ritual with further arcane practices to bind and hold the summoned creature to your whim. This information was provided by a high ranking Jugger Behem cultist name Zarin Chereti; his very words are included, with a notably different style. Reading this section will grant +1 Rank in Knowledge (Jugger Behem). (32 pages). Should the book be subjected to detect magic or identify spells, they will reveal the book does possess a magical aura: conjuration magic is present, of moderate power. If the reader does not speak Luzori, each use of a comprehend languages extract will enable the reader to understand 10 pages at 1st level. SPOILERS No peeking, players! 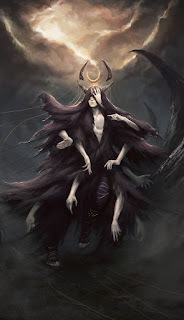 (highlight to read): Part 4 is the most dangerous to read: the cultist Chereti provided the information under duress, and for his sufferings he decided to have his revenge by secretly including arcane summoning rituals in written form. Hidden in the illuminated marginalia are the Jugger sigils: all they require is the touch of the living to activate. 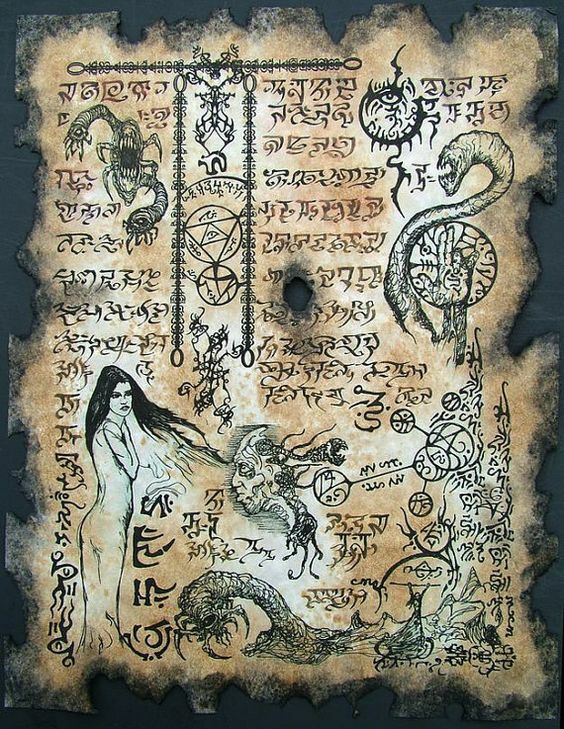 Once activated the sigils vanish from the page, leaving blank circles in their absence. There are two blank circles already evident. Anyone reading this section must make a Perception check DC 20 to notice and realise that the sigils have dark implications; failure requires a Reflex Save DC 15 to avoid accidentally triggering one of the symbols. If triggered, a Jugger Behem emerges from the pages to attack the reader. The book contained 5 sets of summoning sigils; two have been activated already. In Thaumatrian culture the number 7 is considered bad luck, for it is the number of the Leviathans that nearly destroyed civilization centuries ago. Many Thaumatrians avoid the number all together; instead it is common to say “six and one”, for it acknowledges the Gift of the Carcassanc, one of the seven Leviathans that redeemed itself through noble sacrifice. These Thaumatrian customs are reflected in a simple dice game called Leviathan Rising. Leviathan Rising is a game of chance where players roll two six-sided dice – one Red, and one Black – and hope the total of the two dice is one of the preferred results. Each round the preferred results change, and the the odds of failure increases. Before the game starts, all players agree on an buy-in amount that they must pay to qualify for the game. Once everyone has paid their buy-in amount into the pool, all the players rolls 2d6 and tally the result; the player with the highest roll goes first, and play goes clockwise round the group. In the first round, every player rolls 2d6 and adds them together. If the result is a 7 it is a failure, unless the roll is Black 6 Red 1, and they are out of the game. If the result is a success, they remain in the game and must roll again in the following round. If a player rolls a total of 7 they fail, UNLESS the result is Black 6 and Red 1. If a player rolls a total of 6, 7, or 8 they fail, UNLESS the result is Black 6 and Red 1. If a player rolls a total of 5, 6, 7, 8 or 9 they fail, UNLESS the result is Black 6 and Red 1. If a player rolls a total of 4, 5, 6, 7, 8, 9 or 10 they fail, UNLESS the result is Black 6 and Red 1. If a player rolls a total of 3, 4, 5, 6, 7, 8, 9, 10 or 11 they fail, UNLESS the result is Black 6 and Red 1. If a player rolls any result that is not a Black 6 and Red 1, they fail. If only one player rolls a successful result in the round: they claim the pool of bets as their winnings. If more than one player rolls a successful result in the round: they qualify for the following round. If no player rolls a successful result and everyone fails: the game restarts at round 1 with the unclaimed bets going into the next pool. Every player who wishes to continue must pay the buy-in amount into the pool again and the game restarts, with players rolling to see who goes first as above. The game is repeated until there is only one winner. If player leaves the game they forfeit any claim to the winnings or their bets. There is a long standing tradition of the winner sacrificing the original buy-in amount and giving it to the first player to get knocked out of the game, or should that player not be available, given as a donation to the nearest Church of Carcassara. Leviathan Rising is entirely a game of chance; there is little player skill involved, and that’s part of its attraction: most people believe that it is impossible to cheat at the game. Skilled gamblers know how to nurture the dice so that they roll more favourably. It is very hard to do, and as each throw of the dice is heavily scrutinised, even harder to do without being seen. A Sleight of Hand check vs the opponent’s Perception check is required. Sharp-eyed onlookers may also make a Perception check. The Sleight of Hand check has a DC 20 or it has no effect at all. If successful, the player may choose to turn one the dice onto one adjacent face. If the result is 30+ the player may choose to turn both dice onto one adjacent face. Additionally some gamblers like to use loaded dice that have a preference for a particular result. As everyone would benefit from their use, those that like to use loaded dice prefer to slip them into play only later on in the game, usually when there are only one or two other players still remaining. A Sleight of Hand check vs the opponent’s Perception check is required. Sharp-eyed onlookers may also make a Perception check. The Sleight of Hand check has a DC 15 or the player is unable to switch in their preferred dice and must continue play as normal. Most Thaumatrians consider Leviathan Rising to be almost sacred game, and should a player be caught cheating they are very likely to be forced to duel their accuser to maintain their honour. Many a fool has died in this way. If anyone with more gambling skills than me thinks they can see problems or bits that don't work, lemme know so i can make this better! I previewed some of this last week; here's the complete list of languages spoken on the Thaumatrian Continent. As the official language of the Thuamatrian Empire, it is used in almost every region of the continent. It originated within the Thaum Clade of the hero Verlauha, and its alphabet has been appropriated by most other human languages. It is used in the twin Empires of Thaum, Xylano, The Corbando, Estrello, and the Citadel. A distinct regional Clade-born language used in Malazar that incorporates much of the vocabulary of Thaumatrian. Passionately spoken, vibrant, with distinct sibilants and trills. A distinct regional Clade-born language used in Carniga and Carniga Verdad that incorporates much of the vocabulary of Thaumatrian. Forcefully delivered, somewhat harsh and powerful. A distinct regional Clade-born language used in Vulg, Klulsatra and the Vulgo Venganza that incorporates much of the vocabulary of Thaumatrian. Very rounded sounds, using lips to full effect to give each syllable a sonic journey and punctuated with flicks of the tongue. A distinct regional Clade-born language used in Luzori and Rahadu that incorporates much of the vocabulary of Thaumatrian. Complicated intricacies and harmonics are used to give this a very melodious and shrill speech. The origins of this language are unclear, though some claim it is the original language used by the Arkharnen deities when they shared The Garden with humans and taught them all they know. Slow and sonorous in its delivery, many of its sounds are onomatopoeic representations of the natural world. Its written form is very slow to produce, relying on cultivation of natural forms into symbolic shapes. It is most commonly used in Arkhanya and the Lumin Concessions. The archaic language used among noble clades for arcane purposes. Criminal groups use their own slang and symbols to convey covert meanings. A melodic whistling song-like dialect that travels over considerable distances. The grinding, chittering language used by the Bruxi. Humans and Mogs are capable of clumsy attempts at speaking it but it is relatively easy to understand. It is currently developing its own written form based on gnaw marks and scratches. 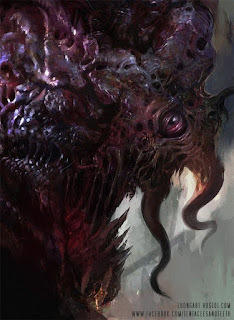 A melange of True Gorgon and Thaumatrian that both humans and gorgons are capable of expressing, born from the slave pits of the Viperium. It uses a hybrid of Thaumatrian alphabet and the shapes of True Gorgon heat-glyphs to give it its own unique written form. The hideous speech of the Jugger Behem; a deep and terrible cacophony of animalistic screams and howls that also incorporates blood-letting for emphasis. It has no written form, though the blood-letting does convey different meaning by location on the body. A sensuous language that requires body contact to fully express subtle nuances. It has no fixed written form, stealing from local alphabets to convey any written concepts. Licking, growling, purring and nipping are all part of the language. A complicated combination of sounds and heat that only gorgons and their reptilian brethren can properly sense. Masterful control of fire is used to create simmering heat-glyphs that may qualify as a symbolic language. The cries and calls of bird songs, as spoken by the owl-like Tylluan. A very difficult language for others to learn to speak, though they can learn to understand. An alphabet born from gouges and claw cuts is used to convey simpler messages, but the more advanced concepts have no written equivalent. ...Malazari is by far the most widely used language, known by almost all. Official state documents and edicts still make use of Thaumatrian, but this is considered an archaic custom by most. Bruxi, Moggi, and Tylluani are common in the ghettos, and the local Gutterspit and Canti are peppered with words borrowed from all three languages. Shanti is widely spoken in the docks and harbours. Given the nation’s close proximity to the Gorgon Conquests, it is possible to learn the Forked Tongue from experienced mariners and soldiers. Other languages are taught at various schools, the most popular being Carnigan due to its position on the northern border, and of course the various occupational jargons are taught as part of trade apprentices and service. When I ain't playing RPGs I'm a passionate astronomer, so world building a celestial cosmology is like crossing the streams for me. Imagining what it would be like to live on a world with two moons, what that would do to geography, the oceans, eclipses, the night, how two worlds in the heavens might inspire or terrify... that sort of thing is my jam. So forgive me if I go a little overboard with this stuff. The Constellations: ..... Groups of Scintillaria, bound by familial bonds. Aurora Arcanus: ..... Skyfire from the arcane barrier that encircles the continent of Thaumatria. ...Astromancers gather at the newly constructed Star Island Observatory to study the heavens. Prior to its official opening, astromancers practiced their arts from the upper reaches of the Cathedral of the Redeemer, and from the observatory run by the University of Malazar. A number of nobles also field private observatories on their estates. Light pollution is a growing problem, and the University operates a second observatory on the heights of the hills to the north of the city. The lensing technology used to produce telescopes has been in practice for only several decades, and the Star Island Observatory houses the largest telescope ever built. Spyglasses are available from several merchants near the military docks, and while they are very expensive their use has proven very advantageous as sea. The worlds of the Zul planetary system orbit their star in a pattern known as orbital resonance, with a ratio of 2:1. This makes predictions of conjuntions and alignments fairly straightforward. The lack of a planet with a 4 year orbital period is a mystery to Astromancers. 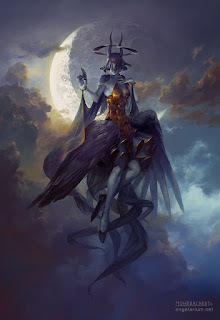 Understanding the motions of the planets is vital to the prediction of eclipse events, for it is during these times that fell creatures appear, bringing death and ruin with them. ...A number of Malazar merchants place great importance on the visibility of Varca the Desire in the sky, claiming it holds great influence over the success of their endeavours. A brilliant golden light, it is sometimes visible in the hour after sunset or before the dawn and its sight is considered a blessing. Matadors, cazadors, gladiators, soldiers and duelists hold the position of Garn the Fury important to their trade. A smouldering hunk of red that glares down from the skies, like Varca it too is only visible around dusk and dawn, though it will linger for much longer and is seen more often. The Rings of Ui-garn trace a faint line of light across the night, and evenly divide the sky in two. Their position relevant to the stars does not change, but their angle and height slowly oscillates over the course of the year. In Malazar, vows sworn and contracts made during the months where Uigarn are highest are considered far more binding and strong. Hri-nah the Shame is like a flickering flame in the night sky, and its presence implies failure for creative pursuits. In Malazar artisans, artists and builders have been known to refuse work or to halt projects for up to six and one months if the planet is present in their family constellation. The first rising of Blue Shar-nah in the night sky is a time of consideration and contemplation, studying the choices and mistakes made of the last year, especially by leaders and politicians in Malazar. Decisions made after much consideration in the light of Blue Shar-nah are far more likely to be the correct choice. On Arkha each day is 26 hours long, each week is 6 and 1 days long, each month is 4 weeks long, each year is 364 days long. The small pale moon of Ridat also takes 28 days to orbit Arkha; its tidelocked to Arkha and always shows the same side towards the planet. The large silver moon of Lumin takes 91 days to orbit Arkha, and each day on Lumin lasts 13 Arkhan days. Most Thaumatrian cultures use a week consisting of 6 and 1 days, with work being conducted on each day save the last, which is a day of religious observances and rest. 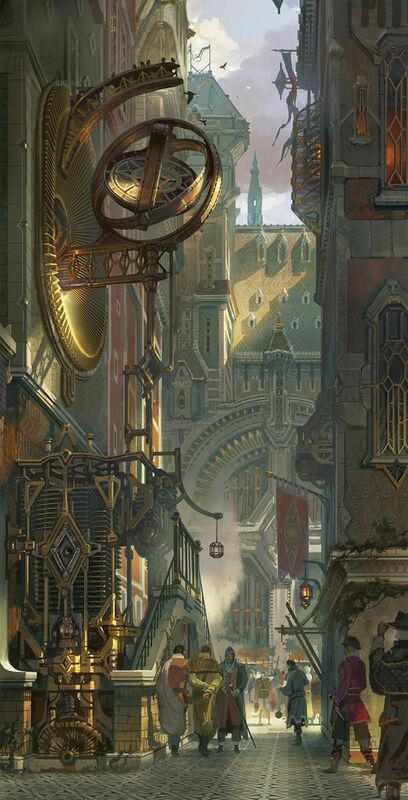 ...Chronomancers — a specialist field of Astromancy — are responsible for tracking time and informing the city of its daily progress. The Star Island Observatory has a time ball and bells that are activated on the hour every hour, and are used to calibrate navigation system and track hours of employ in the city’s factories. Chronomancers track the movement of the stars above to gauge their time pieces and citizenry often use notched time candles around the home to mark the passage of time. Each solstice and equinox is a time for celebration, and the coming of the New Year is the greatest. Sacricarne — the day when the Gift of the Carcassara was received — is revered and rejoiced on the first day of spring, and the Founding of Malazar is acknowledged on the last day of autumn. Each event is celebrated with religous observances for the pious, and masquerades, music, parades, parties, and monstromaquias for the rest. During the summer months the population escapes the heat of the day by returning home for siestas. Merchants and businesses open much earlier, shut for the middle of the day, reopen in the afternoon, and close much later in the evening. The world of Arkha has two moons, and with five or more planets they orbit Zul, the brilliant star at the heart of the system. As such, solar, planetary and lunar alignments — when three or more celestial objects from a straight line with each other — occur a number of times each year. When these alignments are particularly close, and one of the celestial objects involved includes Zul, then there is a chance that an eclipse will occur. The shadows cast by the celestial object closest to Zul fall upon the surface of the celestial object further from Zul. This is an eclipse. Understanding and predicting the occurrence of eclipses is of vital importance: when an eclipse occurs, arcane portals open upon the surface of Arkha. Though these portals come terrible creatures from some alien planet or plane of existence, monsters that seek only to kill all they encounter. Astromancers have become very skilled at predicting solar and lunar eclipses that involve Arkha’s moons of Lumin and Rindat, less so when eclipses involve one of the other planets. While they can warn when an eclipse will happen, they have yet to understand where on the surface the portals will open. FLINTLOCK FANTASY: Episode I Play Report! First session of the Malazaria Campaign! Finally! We kicked of with a solar eclipse over Malazar City, calculated and forewarned by the Royal Astromancers. Eclipses on Arkha are bad. When they happen, the Jugger Behem slide down the moonshadows to maraud and molest. Malazar City, like most urban centres, has standard procedures in such times: shut up the shops, shut down the city, slap a curfew on everyone and send the city guard out in force. Specially trained monster hunters known as cazadors prowl among them, eager to capture any monstrosities. Across the city the bells tolled until the moon swallowed the sun and all was plunged into night. The city guard called for all to head in, and one by one they headed down to the tavern to wait out the eclipse. Nym lingered, and as he was about to head down another Mog landed on the rooftops. "Where is your pride?" he asked then sprang down into the gloom. Inside, the three gathered for drinks (not Lucinda, there were several other customers to serve waiting out the eclipse in the Arms) and they talked over scuttlebutt of the city including the war against the Emulatine Renegados and the monstrous Hydiac that was prowling the city slums (each session I'll supply the players with a onesheet of local events and gossip from the city's papers, you can read the first one here: CURRENT EVENTS). Pedro, ever helpful, was checking the shutters were indeed shut when he heard slow footsteps on the wharf alongside the Welcome Arms. He looked out to see four ill-favoured men sneaking towards him. He darted back inside to warn the others, then dashed to the bar where his musket was stowed. One of the other customers — a local ragwoman — ventured to the door and looked out; the four men burst in, each wielding a pair of cruel looking machetes. It was the Machetza Gang! Weapons were drawn: Ramon rising to his feet and unsheathing his rapier, Nym coolly placing his blade on the table before him, Lucinda reaching for a knife, and Pedro quietly priming his musket from behind the bar. One of the Machetzas pushed the unfortunate woman against the wall, as their leader stepped forward, weapon pointed... at Nym! "We're here for the Book. Hand it over, or you'll die." Nym politely refused as Largo the Bouncer positioned himself between the Machetzas and the rest of the patrons. By some curious design the centre of the tavern was open to the water below (great for a pint and a fish, we decided) and more Machetzas were crawling up over the railing around the fishing pit. Ramon saw their plan: stall with words until enough Machetzas arrived to make negotiation unnecessary. He hobbled over and kicked the first one back into the water below, the pain of his injury coursing through his leg. The Machetzas responded with violence. The first blow didn't kill Largo, but the second one definitely did. Ramon squared up against the two murderous Machetzas while a third charged at Nym as he quaffed one last dreg from his mug (actually an alchemical extract he had handy). The fourth let the woman go and moved towards Lucinda at the bar (who also skolled an extract she had on her). Pedro popped up from behind the bar and fired at the leader, grazing him, while two more Machetzas scrambled up over the railing in the centre of the room. Lucinda's knife went wide, and she darted for the flammable liquors at the end of the bar, while Ramon duelled two, and then three Machetzas by himself. Nym was cut bad by his attacker, who watched in amazement as the Mog sprang away and darted for the stairs that led up to his room where the book the Machetzas were after lay upon his table. Ramon fought desperately, parrying and riposting against the six blades he faced (this Swashbuckler class is cool!) but failed to fell them. Pedro saw one of the Machetzas rounding the end of the bar to get at him, raised his musket once more— FZZZZTzzzzzzz... a Misfire! His assailant was almost upon him, when a bottle smashed over the Machetza's head. The other patrons had joined the fray, coming to the defence of their favourite watering hole! Of the two Machetzas still standing to face Ramon, one threw down his blades in the face of such skill and bolted for the door, but the second pressed on! Meanwhile Pedro fell back from the Machetza behind the bar. It could have been the broken bottle in the patron's hands, or the knife that Lucinda jammed in his gut that felled him, but that Machetza was slain as well. Lucinda glanced up to see the dark haired woman by the door unrattled by the attack, unfaxed, mumble under her breath and then vanish! Was she in league with the Machetzas? She had opened the door that let them in... where had she gone? Lucinda threw a bottle at where she last saw the vanisher, but it failed to find its mark. As Ramon and the patrons finished off the last of the attackers (another fleeing for his life), Nym reached his room in a flash, powered by the curious extract he had prepared that made him exceedingly fleet of foot. Inside, he grabbed the bundle of tightly bound cloth that was wrapped around the book, grabbed his crossbow and a few other items, and was about to make for his window and bolt... when the woman from below was at his door. "Don't make me do this," she warned as she held her hand out for the book Nym was holding. He got a good look at her: dark hair cut short in a bob, a pleasant but worn face, haggard eyes and attire that marked her as a fishmonger, perhaps... but her odor was terrifying. Unnatural. And her hand... her hand was shaking so violently that it shimmered and danced in the strange eclipselight through the window. "Give. Me. The. Book." Mogs are exceedingly fast and nimble, and Nym even moreso: he was out the window in the blink of an eye, and scrambled up onto the roof of the Welcome Arms. But whoever this strange woman was... she did not follow. Instead, from his vantage point he could see the eclipse in the heart of of its transition. All around was dark as night, dark enough to see the stars, to see the Aurora Arcana dancing across the sky... and yet on the horizon, the glow as of dawn in every direction. 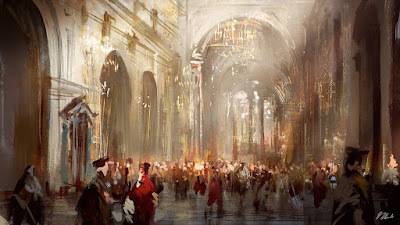 The city lay in silence, not a single bell tolled in alarm— and then he noticed that the few city guard he could see in the streets and alleys below all were standing with their backs turned to the Welcome Arms. Surely they'd heard the musket fire, the screams? Or had they been bought off by the Machetzas? And where was the woman? It was Ramon and Pedro who found her. Lucinda was tending to Largo's fallen body, and gave orders to the rest of the staff to clean up quick before the guard arrived. Limping up the stairs (his war wound bleeding heavily now) Ramon reached the top and looked down the corridor to see the woman closing the door to Nym's room. Nym's stolen notes were in her shaking hand, and she did not see Ramon, nor Pedro as he scrambled up behind him. Pedro wasted no time and fired his musket once more as Ramon hobbled down the corridor towards her, rapier drawn. The shot hit her, but did not fell her— yet the pain have distracted her for Ramon attacked before she could act, thrusting his blade through her shoulder and pinned her to the wooden panels behind her. Nym heard the gun fire below, the ruckus of combat— and a sudden movement in the air caught his eye. 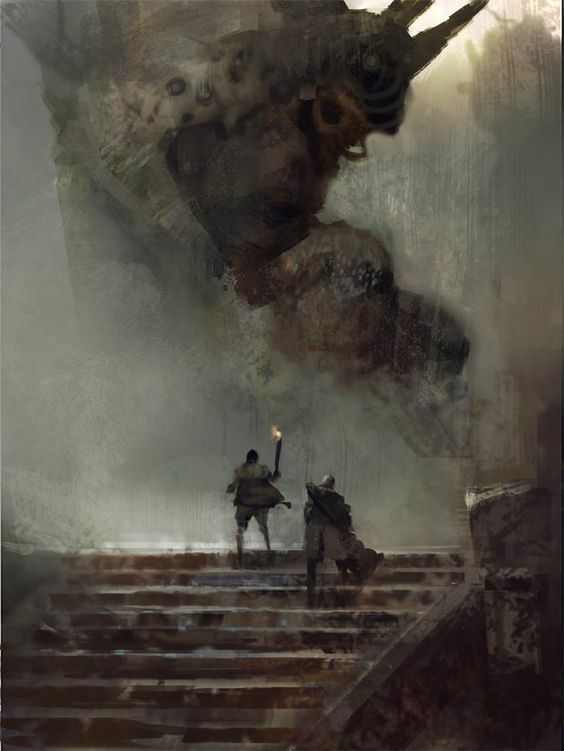 Descending from a great height to land beside was a royal cazador, one of the brave souls trained to hunt down the Jugger Behem. He was a Tylluan, an owl man from the far north, white feathered, golden cloaked, and armed with a long and curved scimitar. "Return to your quarters immediately!" he croaked. Nym quickly explained what was happening, without giving everything away. ... and the corridor was filled with tooth and tentacle, eye and maw, groaning under the sudden weight of the horrendous creature unfolding into the world before the rat man. Pedro turned and fled, squealing in terror (Save vs Fear: failed!). Nym and the Cazador caught his cry, and leapt back down into Nym's room. The door to the hallway creaked and groaned. "Open the door," order the Cazador as Nym readied his crossbow, then flipped the latch. The door burst in, a wall of bestial meat pressed upon it. The bolt flew, struck the monstrosity; the scimitar dug deep into the flesh. Whatever it was, it pushed hard against the constraints of the hall, wood cracking, and with a horrendous shriek the side of the building burst open. The creature spilled out and down into the street below; Nym grabbed hold of the shattered doorway as his room toppled forward. The last Nym saw of the Cazador was a flick of golden cloak and scimitar as the hunter gave chase— and they were gone, leaving Nym's notes slowly floating down in the vacant air. (Crap this has turned into a story writing exercise, sorry). When the group came together again in the tavern below, Lucinda led them to a private room beneath the building. Nym had questions to answer, and quickly, before the city guard arrived. Placing the heavy bundle on the table, he explained that he was given the book by his friend and mentor, after a deal with the Machetzas went sour and his friend incarcerated. He unwrapped the cloth and revealed what the Machetzas were after: a book made entirely of stone. It must have come from the Stoneland Wastes, they reasoned, where a decade ago a terrible accident occured in the city of Kvantio, and everything within a hundred mile radius was completely turned to stone. People, creatures, forests, possessions, water, clouds... everything. FOr several years explorers had been salvaging what they could from the Wastes. It was highly likely that the book had come from there. Each page was paper thing but hard as granite, and Nym gingerly turned each one. The ink had turned to obsidian. The book was written by Doctor Palso Anduriac in Luzori, the language of the region. None of the four could readit, but it was clear from the illustrations that it was notes and experiments with a new kind of firearm, that appeared to be more powerful and deadly than anything they had seen; the book also contained depictions of strange and monstrous magical rituals. Hideous creatures cavorted in the margins, while arcane diagrams filled each page. The all agreed that the money should go to the repair of the Welcome Arms, as well as to Largo's family, and then decided how much they would tell the authorities about what they knew; but the four had so many questions themselves! - Who was the strange woman? - Was that the Hydiac? - What was her relationship with the Machetzas? - Why do they want that book so much? - Who bribed the City Guard to avert their attention during the attack? - Who was the Mog that approached Nym on the rooftops? - What happened to the creature after it fled? - Did the Cazador Tylluan survive? - Should they find a safehouse to wait out the inevitable revenge attack by the Machetzas? - Who was coming to question them, bribed City Guards, or the Royal Cazadors? - How fast can they translate the book? Both Nym and Lucinda can prepare concoctions that will aid them in comprehension... but should they? - and perhaps most importantly... when's the next game??!?!?!?!?!?! ?